An icon of classic motorcycling, the Gold Star always attracts attention – even eight decades after it first fired up. 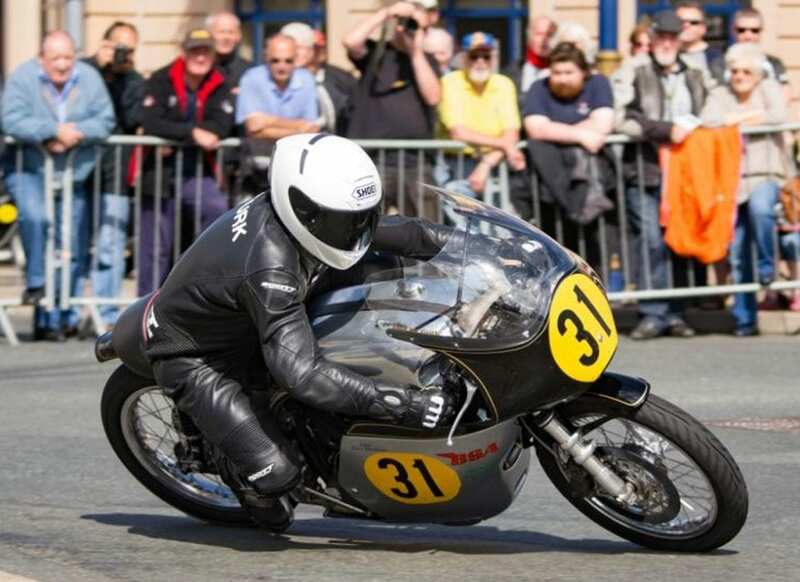 The post-war Goldie takes centre-stage at this year’s spring Stafford Show where you can buy a DBD34 replica in the auction, watch a DB32 being rebuilt, and then admire a Manx Grand Prix record-breaker. What’s so special about Gold Star singles? And what do all those CB/BB/DB designations mean? 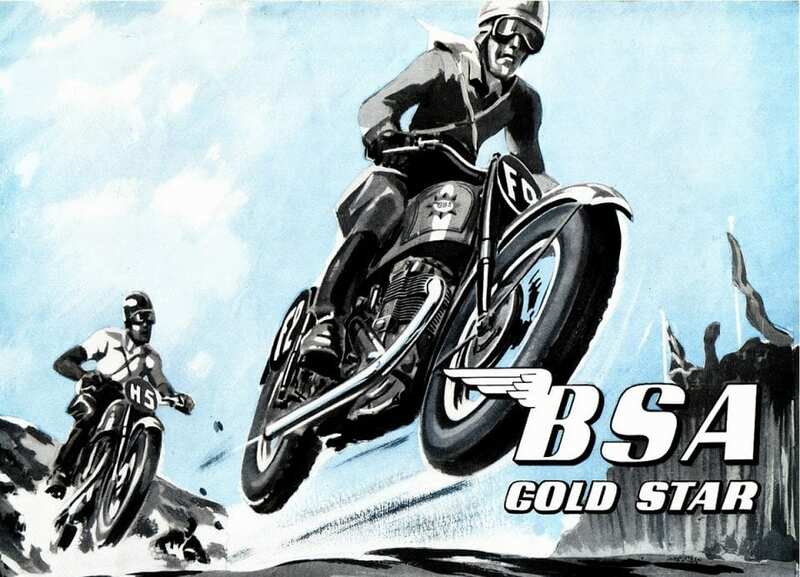 We’ve talked before about the pre-war origins of the Goldie, when BSA’s Empire Star won a coveted gold award for lapping Brooklands at over 100mph. The name was revived after WW2 and even now, 50 years later, it still turns heads. The new-for-1948 Goldie was based around BSA’s ohv B-range of streetbike singles. The first version was the bench-tested, all-alloy 348cc engined B32, which used the marque’s plunger frame and which boasted a wide range of options to suit the customer’s competition requirements. All of which means there’s now no such thing as a ‘standard’ Gold Star: they might all have been made to a slightly different spec and a long succession of owners will have further developed their bikes over the decades. Owners could specify cams, compression ratio, carb, cylinder head, exhaust, gearbox ratios, lighting, tyres and electrical systems. The components were carefully selected from stock, and the bikes skilfully assembled by hand. The alloy head and barrel meant that the Gold Star was some 20lb lighter than its all-iron stablemates. 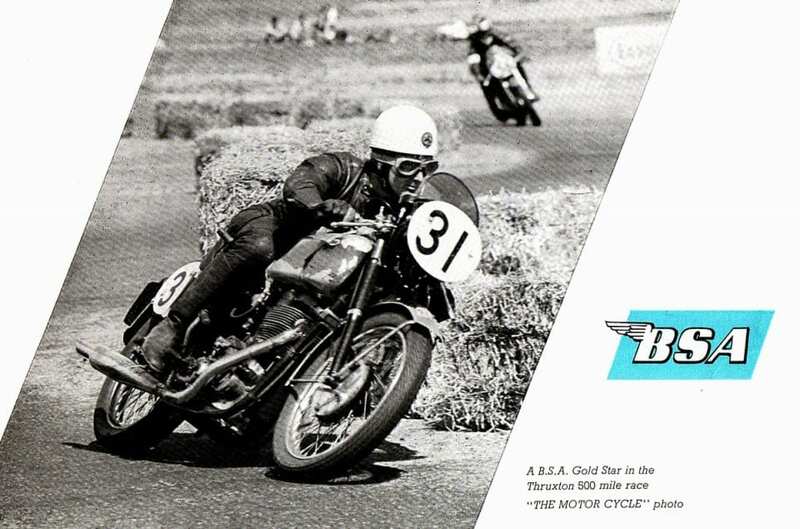 As a clubman’s racer, the Gold Star proved to be fabulously successful, and it dominated the 350 class from 1949 to 1956. A year later, the 499cc B34 joined the fray with a different main bearing and revised crankshaft, but the same attention to detail and sporting performance. For 1950, a bigger front brake was fitted and for 1952 the 500 Goldie gained a new cylinder head, designed by Bert Hopwood. 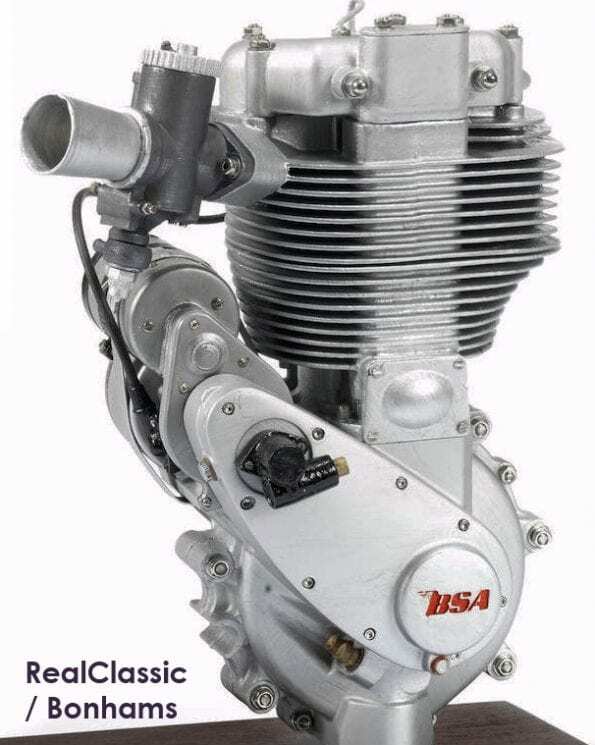 The 350 adopted the new head the following year and BSA made many detail changes to keep the bikes competitive. A major change arrived in 1953 with the new duplex cradle swinging arm frame and its twin-shock suspension, together with an improved gearbox. This model was designated the BB and customers could specify this state of tune for a couple of years. 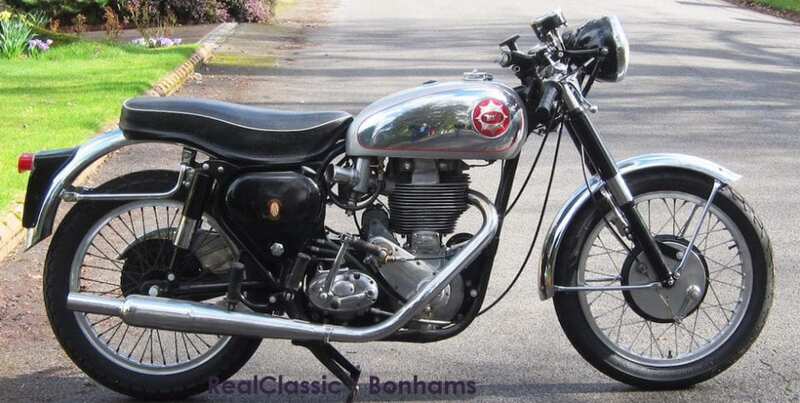 The CB models arrived in 1954 with a new engine which featured additional, square finning, a shorter conrod, stronger crank, oval flywheels for the 500, modified valve gear, an Amal GP carb and a swept-back exhaust. 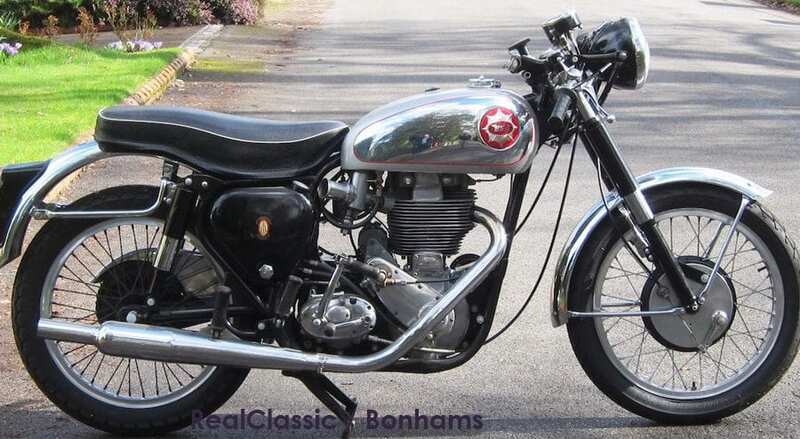 Then for 1955 came the DB models with improved crank oil feed, finned front drum brake and a special silencer which was paired to the clubman models’ cams and timing. For a short while it was possible to specify either BB, CB or DB engines, until the earlier types were discontinued at the end of 1955 when the final (and many say the ultimate) Gold Star arrived, the DBD34. This offered a modified cylinder head, tapered silencer and used the largest GP carb available. 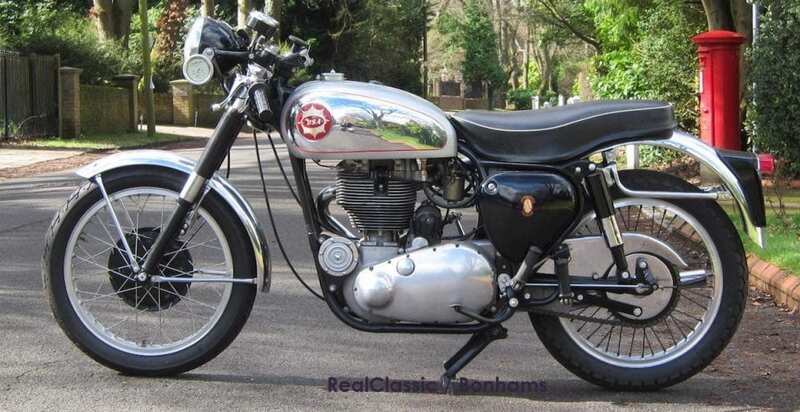 BSA’s racing 190mm full-width front brake was available as an optional extra. Soon the touring and road-spec models were dropped and the Goldie became a competition-only motorcycle in clubman and scrambles formats. Finally in 1963, as BSA prepared to switch to its new unit-construction engines and the B31 and B33 went out of the production, the last DBD34 was built. These days even the most ordinary Goldie in touring trim will set you back a five-figure sum and ones with alloy tanks and a clubman racer specification easily fetch £20k. 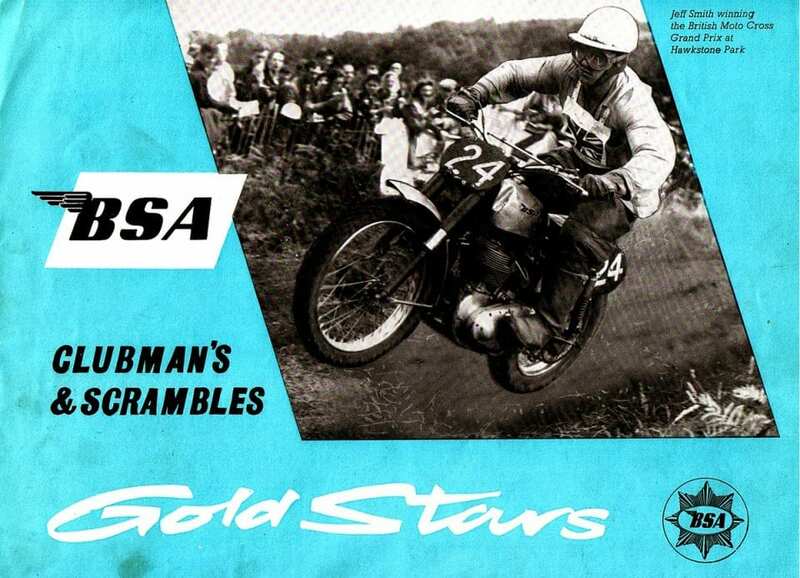 So it’s hardly surprising that people who want the Gold Star experience create tribute machines and replicas from BSA’s mass-produced streetbike singles. The bike seems to have been off the road for nearly two decades and comes only with an old-style V5, which is why it’s estimated to sell for around £8000, less than half the price of a well-documented Goldie that’s been authenticated by the owners’ club. Someone who’s not particularly fussed about originality or provenance – perhaps who wants to take a Goldie classic racing – will undoubtedly snap this one up. Gold Star enthusiasts will also want to check out the club’s display in the main hall, to admire in particular one record-breaking bike. Back in 2007 and in the spirit of the original Brooklands award, the club offered a prize for the first 100mph lap on a Gold Star during the full race distance at the Manx GP. Member Dave Hardman took up the challenge; he got Gold Star specialist Phil Pearson to rebuild his bike which Phil McGurk then campaigned at the Isle of Man. Pearson had to build an engine which was not only rapid but also extremely robust: it would have to withstand several practice sessions and then more than 250 miles at full racing speeds. 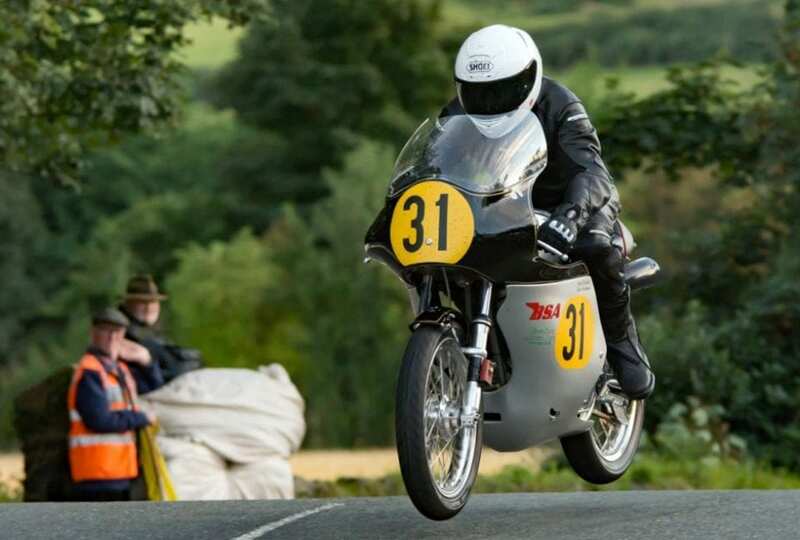 And this Goldie really is quick – it was clocked at 129.3mph at the Sulby speed trap. During practice the gearbox suffered a broken tooth which could’ve spelled disaster – but Bob Light came forward and donated the gearbox from one of his own bikes. It was then all down to rider Phil McGurk who didn’t disappoint. He completed the four-lap race, averaging 99.9mph overall and breaking the magic ton on lap two, at 101.03mph. You can this very machine on display at Stafford. If a whole Gold Star really is beyond your reach, then how about this magnificent model? 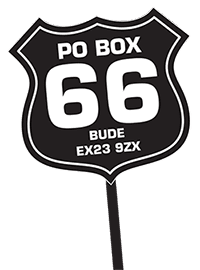 Made by Moto-Miniatures, the 25cm-high replica is being sold for charity in the Bonhams auction. At around 4/10th scale, the finely-detailed model is based on original components and engineering drawings and is made from more than 150 separate components, with stainless steel fixings. It was hand-finished and painted and is mounted on a wooden base within a perspex display case. It’s expected to fetch at least £500. You’ll find all this (and heaps more) at the 2017 Carole Nash Classic Motor Cycle Show on 22nd and 23rd April, at Stafford County Showground, ST18 0BD. Adult admission costs £12 in advance if you buy tickets before midnight on Monday 17 April 2017.